Since the development of the oil technique during the early 1400s, the equipment and chemicals necessary for painting were simply too cumbersome to remove them easily from artists' studios. By the late 1700s, some painters did venture outdoors to sketch in oils, but their refreshing, small-scale works were normally considered mere training exercises. The ability to create finished canvases away from the studio hinged on a British patent granted to John Rand, an American artist-scientist. In 1841, Rand invented collapsible tin tubes to hold premixed oil paints. Prior to Rand's paint tubes, artists who desired to work on-the-spot in oils had relied either on glass vials, which break, or animal bladders, which leak. Now, with their supplies packed in portable cases, painters were free to capture visual impressions on site, whether indoors or out. By the late 1860s, a few French artists discovered that natural appearances differ greatly from the controlled light, careful detail, and balanced arrangement of works conceived in the studio. Their innovations of complex color brilliances, optical focus, and seemingly random compositions reached the United States by the mid-1880s. The French impressionists dealt candidly with the working and middle classes, whereas American impressionists favored portrayals of well-dressed, well-mannered high society. While the United States emerged as a world power at the turn of the twentieth century, many American painters and patrons sought sophistication by choosing such genteel subjects. Even in landscapes, American artists often selected picturesque views, such as gardens at moonrise or holiday promenades. Most major impressionists in the United States belonged to The Ten American Painters, a select group who presented annual shows in New York City from 1898 to 1906. America's leading impressionist, however, was the expatriate Mary Cassatt. She also used her social standing as the daughter of a Pennsylvania banker to persuade other wealthy Americans to purchase avant-garde art, thereby helping introduce French impressionism to the United States. 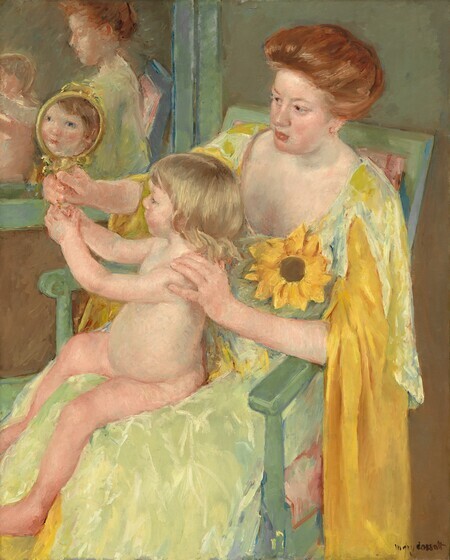 Since she lived abroad and, from 1879 to 1886, participated in four exhibitions that the impressionists held in Paris, the National Gallery of Art displays Mary Cassatt's paintings in its French rooms. 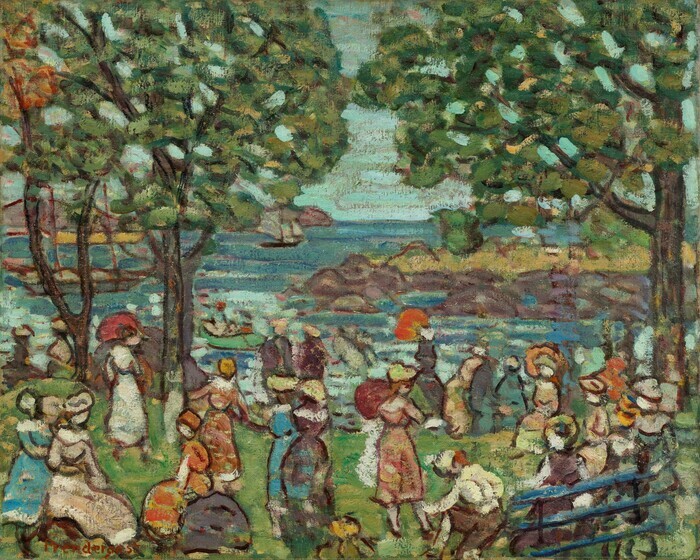 An instructor at the Boston Museum school, Frank Benson created lovely daydreams of women and children frolicking outdoors. One of his daughters recalled their family vacations in North Haven, Maine: "Papa would often have us put on our best white dresses and then ask us to sit in the grass or play in the woods. We thought it was so silly and the maids made such a fuss when they saw the clothes afterwards." These modeling sessions resulted in such idyllic works as Summer of 1909, now in the Rhode Island School of Design, Providence. In that breezy grouping, Margaret Strong, a seventeen-year-old neighbor, looks uphill toward three other girls who, in turn, converse with her or peer out to sea. 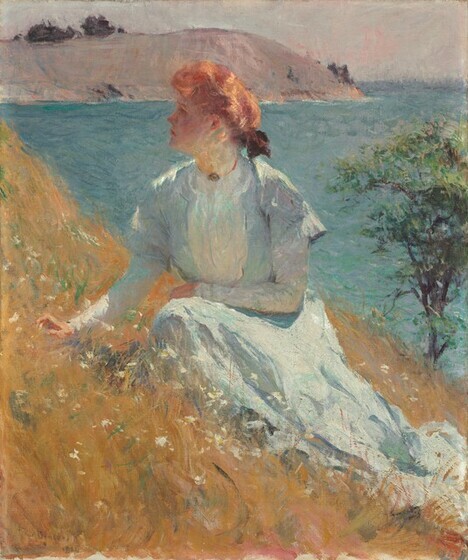 Delighted with Benson's portrayal of their daughter and also anticipating her forthcoming marriage, Margaret's parents asked him to paint her individually just as she had posed in Summer. In a very daring maneuver for a commissioned portrait, Benson left Margaret's face still turned away from the sun. He did modify the design by raising the beach line of the distant cape so that, here, it would not cut across her profile. Her striking, coppery red hair frames her head, keys into the warm tan grass, and complements the blue Atlantic and the cool, iridescent shadows. Above all, the dazzling virtuosity of Benson's rapid brushwork captures attention. 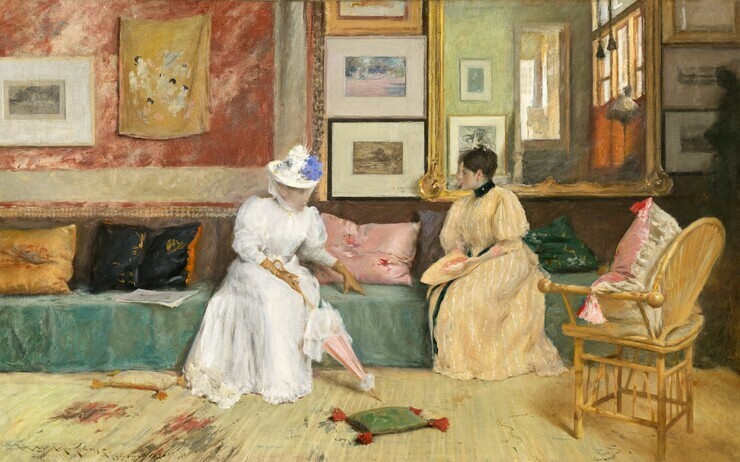 A Friendly Call takes place in William Merritt Chase's own studio at his summer home near Shinnecock, Long Island. A new vogue for Oriental aesthetics accounts for the bamboo chair, reed floor mats, and silk wall hangings. Such elegance transforms a functional workroom into a private exhibition gallery. This recent rise in the social status of painters had been brought about by the "art for art's sake" movement. The painter's wife, Alice Gerson Chase, greets an unidentified caller. According to the rigid social etiquette of the 1890s, the hostess has not yet asked—or may never permit—her guest to relax, put down her parasol, and remove her gloves, hat, and veil. The ladies lean symmetrically toward each other and the center of the geometric composition with its long, low banquette and carefully arranged cushions and framed pictures. As an impressionist, Chase used the large mirror to capture a soft-focus reflection of the sunlit hallway and stair leading to his airy studio. In his early twenties, Chase had left Indiana to study abroad, rejoicing, "My God, I'd rather go to Europe than go to heaven!" Later, this easygoing man encouraged so many students in Manhattan, Brooklyn, Philadelphia, and at this Long Island summer studio that he boasted, "I believe I am the father of more art children than any other teacher." 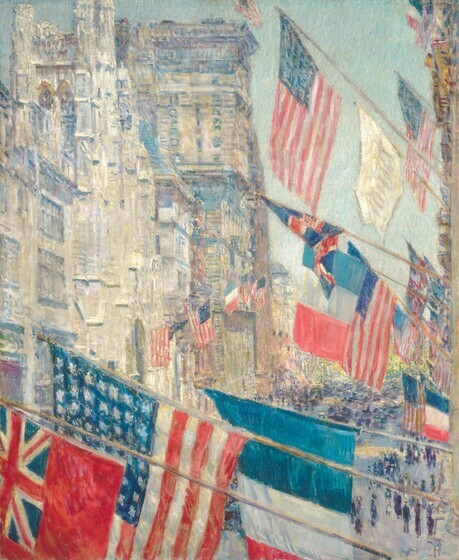 Allies Day, May 1917 is one of about thirty oil paintings that Childe Hassam made of New York City's flag-decked streets during World War I. On 9 and 11 May 1917 the British and French war commissioners paraded down Fifth Avenue, temporarily proclaimed "the Avenue of the Allies," to celebrate the United States' entry into the war. The slogan "Show your colors" brought forth a patriotic flurry of Union Jacks, Tricolors, and Stars and Stripes. With his easel on a balcony at the corner of Fifth Avenue and Fifty-second Street, Hassam looked northward past Saint Thomas Episcopal Church, the University Club, and the Gotham Hotel toward the yellow-green spring foliage in Central Park. The bold designs of the flags and the strong lines of the architecture well complement each other. So that the sky could compete with these vigorous shapes and assertive colors, Hassam applied vivid aqua blue in upright streaks that march across the air, much like the pedestrians who stroll in the street below. On his second trip to Europe in 1886­1887, Hassam had been among the first Americans to embrace French impressionism. With his New Englander's worship of order, however, he consistently subjected his compositions and brushstrokes to a geometric rigor. Hassam even claimed, somewhat dubiously, "I have to de-bunk the idea that I use dots of color, so called, or what is known as Impressionism." In the later 1880s, Willard "Willy" Metcalf visited and summered four times at Giverny, northwest of Paris. Giverny had been home to the famous impressionist Claude Monet since 1883. 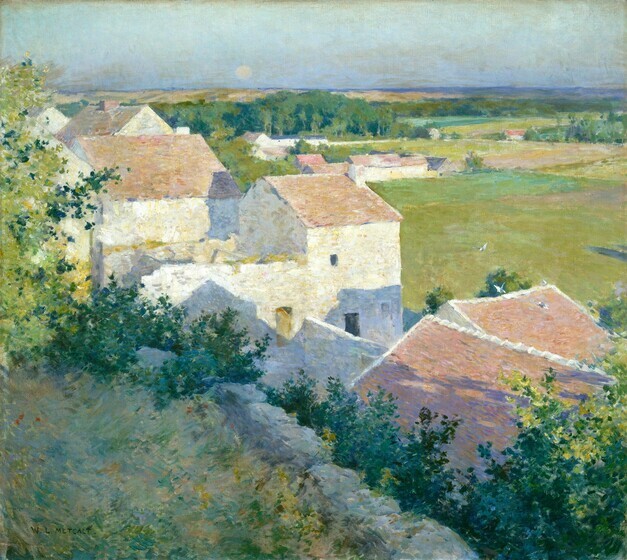 Although Metcalf knew the older French painter, it was the rustic village itself that drew the young American to the area. The calm structure of Giverny's plowed fields, stone-walled roads, and tile-roofed farmhouses fascinated many painters. Here, several building eaves and crop lines point toward the shimmering orb of a full moon rising through rosy clouds over the eastern horizon. Sunset imparts a yellow warmth to the stuccoed walls, while the complementary color of violet marks the lengthening shadows of late afternoon. The deep blue-greens of the foreground bushes similarly balance and contrast with the red-oranges of the terracotta roofs. Metcalf traveled incessantly, painting Italian villages in the Tuscan hills, Arab markets in Tunisia, and Zuni pueblos in New Mexico. Despite his restlessness, he kept returning to his native Massachusetts. His New England woodland and coastal scenes captured every season of the year and eventually earned his fame. Ironically, for an artist who could so beautifully convey the earth's placid serenity, Metcalf led a bohemian life obsessed with women, alcohol, and occult spiritualism. A feisty, aggressive man, Edmund Charles Tarbell had such control over a group of followers at the Boston Museum school that critics nicknamed them "the Tarbellite gang." Tarbell also commanded respect later in Washington, D.C., when he served as principal at the Corcoran Gallery's School of Art from 1918 to 1925. His insistence upon precise draftsmanship resulted from his teenaged apprenticeship to a lithographic company and his academic studies in Boston and Paris. Unlike the bravura sketchiness and vivid colors preferred by his friend Frank Benson, Tarbell emphasized solid, three-dimensional forms. To challenge himself by painting interior and exterior light in the same composition, Tarbell often depicted the tall French windows at his summer home in New Castle, New Hampshire. 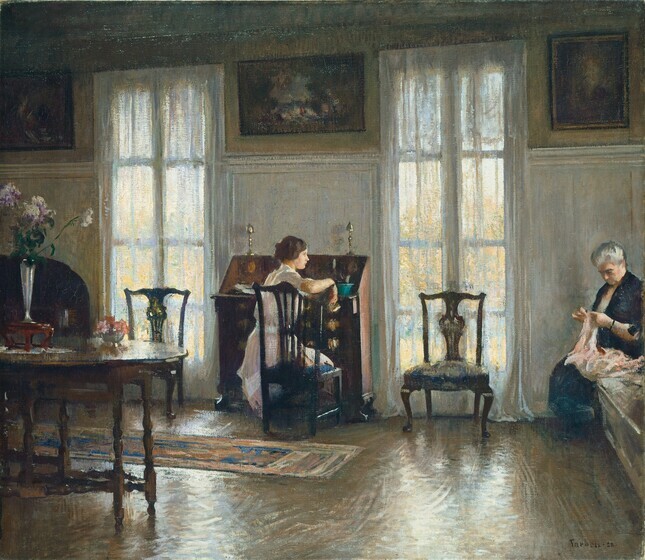 In Mother and Mary, the rectangular shapes of these windows as well as of the picture frames and wall moldings are played against the curving lines of the Chippendale chairs, oval gate-leg table, and tranquil figures of the artist's youngest daughter Mary, pausing at her writing desk, and his wife Emeline, occupied by her sewing. The Colonial Revival decor mixes furniture styles by using both antiques and reproductions. Criss-crossed over the polished floor, long brushstrokes imitate the luster of reflected sunlight and reveal the marks of hand buffing on the freshly waxed wood. A native of Cincinnati who had studied in Munich and Venice, John Twachtman moved his family to a farm near Greenwich, Connecticut, within commuting distance of his teaching job in Manhattan. In two purchases of March 1890 and December 1891, he acquired more than sixteen acres, including the rocky bed of Horseneck Brook that opens into a quiet pond surrounded by a grove of hemlock trees. Shortly after signing the mortgage, he wrote to a fellow artist, "I can see now how necessary it is to live always in the country—at all seasons of the year. We must have snow and lots of it. Never is nature more lovely than when it is snowing. . . . That feeling of quiet and all nature is hushed to silence." 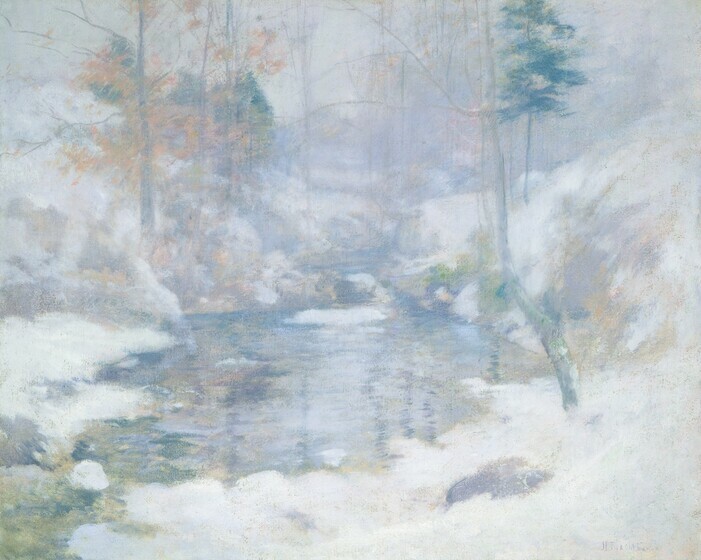 Winter Harmony is one of Twachtman's many studies of the pool on his property. The silver-gray tones and subdued blues and mauves evoke the evanescent transitions of light on an overcast day. The feathery touches of Twachtman's brush are very evident in the shimmering greens of the hemlock needles and the golden brown leaves that still cling to some branches. Unlike a French impressionist, who built up a scene with separate touches of color side by side, Twachtman adapted an old master technique of scumbling nearly dry paint into overlapping layers. He worked loosely so that the underlying tints and shades show through between the irregular, incomplete textures of covering strokes.